Pressures from depreciating currency and general macroeconomic weakness that LATAM Airlines Group faced throughout 2014 show no signs of abating in 2015 as the economies in some of its largest markets remain on shaky ground. But despite those challenges, LATAM does see some opportunities to strengthen its network in 2015, reflected in its unchanged capacity forecast of 2% to 4% expansion with flat growth in the Brazilian domestic market. Even with its sustained capacity discipline in Brazil, LATAM is making a new push from Brasilia in 2015 to leverage smaller regional markets that could help improve its overall performance in Brazil’s domestic market. LATAM also plans to grow its long-haul international capacity as some North American and European airlines have slowed capacity growth, which is a positive development for LATAM as it continues working to mitigate some of the weakness within South America. LATAM Airline Group plans flat capacity growth within the Brazilian domestic market during 2015 after recording a 1.5% decline in 2014 based on data from ANAC. Brazil’s two largest airlines TAM and Gol have cut capacity during the last couple of years as the country’s weaker economy has created some pressure on demand and pricing. 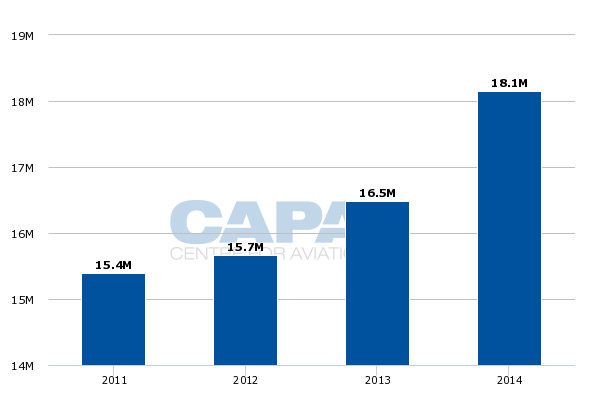 Total capacity in Brazil’s domestic market increased by only about 1% in 2014 while traffic grew by almost 6%. During 4Q2014 LATAM’s unit revenues in Brazil fell 13.5% year-on-year, but loads increased 2ppt to 83% on ASK growth of 2.7%. The airline is obviously attempting to maintain strong loads as pricing traction in Brazil is tough given the decline in corporate demand driven by the country’s weak economic conditions. Brazil’s GDP growth is forecasted at 1.4% in 2015 after inching up just 0.3% in 2014. Those numbers pale to the 7.5% economic growth the country recorded in 2010. LATAM also faced currency pressure from the devaluation of the BRL against the USD throughout 2014. During 4Q2014 the BRL depreciated nearly 13% against the USD. BRL accounts for about 30% of its total revenues. Most of LATAM’s 5.2% rise in traffic within Brazil during 4Q2014 was largely driven by growth in leisure passengers as corporate demand remained pressed, down roughly 15% year-on-year. Despite the economic challenges in Brazil, LATAM is working to leverage Brazil’s third busiest airport (based on aircraft movements) Brasilia in 2015. TAM is adding eight to 11 destinations from Brasila in 2015; but it is still maintaining flat capacity growth overall as it reduces services elsewhere in Brazil. Previously, TAM has announced new service from Brasilia to Rio Preto, Boa Vista and Iguassu Falls and long-haul flights to Orlando. 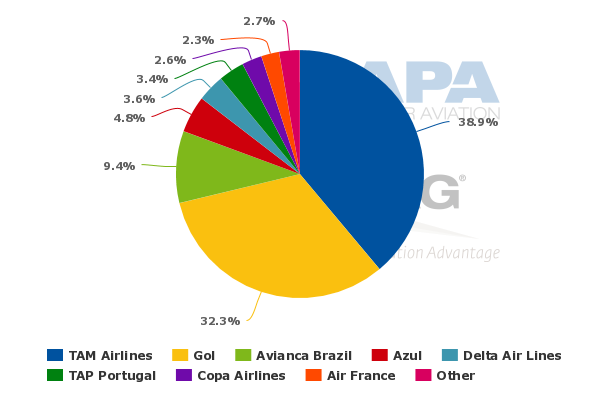 Data from CAPA and OAG show that for the week commencing 23-Mar-2015 TAM is the largest airline operating from Brasilia measured by ASKs with an approximate 39% share followed by Gol’s 32% share. The airport recorded roughly 10% passenger growth in 2014 to 18.1 million, and recorded a 12.7% rise in Jan-2015 and 2.7% growth in Feb-2015. Offering its assessment of the opportunities Brasilia represents, LATAM has stated that Brasilia is an attractive airport given its location in central Brazil. Brasilia also has a higher GDP per capital relative to other South American cities, said LATAM. LATAM’s push from Brasilia is part of a regional strategy the airline is adopting that includes the addition of four to six regional markets per year sized at 100,000 to 1 million passengers. TAM is initially operating those routes with 144-seat Airbus A319 narrowbodies, but in 2014 stated it was evaluating regional jets, including the Embraer E2. TAM has also reunited with small regional airline Passaredo under a codesharing pact to reach smaller markets not viable for larger aircraft. Nine markets are included in the partnership – Araguaína, Barreiras, Cascavel, Dourados, Pampulha, Sinop, Três Lagoas, Uberaba and Vitória da Conquista. Passaredo operates a fleet of ATR and Embraer turboprops and 50-seat Embraer regional jets. LATAM has concluded that the regional strategy it is adopting in Brazil’s domestic market should improve unit revenues by accessing some corporate markets where it does not have a presence. But obviously its regional plans is still unfolding and the company still faces short-term economic weakness in Brazil. It could be addressing those challenges by redeploying capacity from what may be under-performing routes into more promising markets. LATAM plans to pursue 4% to 5% capacity growth in international markets (long haul and regional) in 2015. After seeing some capacity pressure on long-haul routes in 2014, the company has observed capacity reductions by other airlines from South America to North America and from South America to Europe. 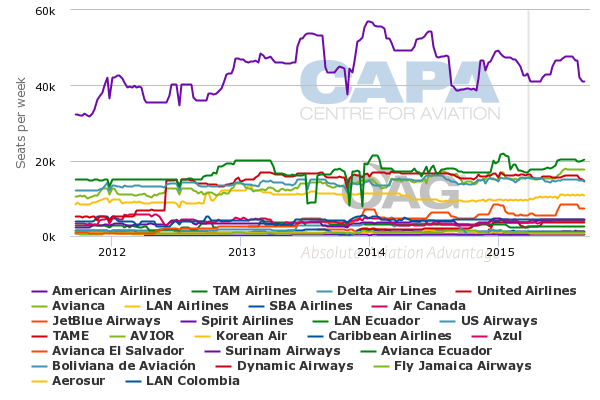 Data from CAPA and OAG show that for the week commencing 23-Mar-2014 that one-way seats on offer from upper South America to North America are down by about 2% year-on-year. 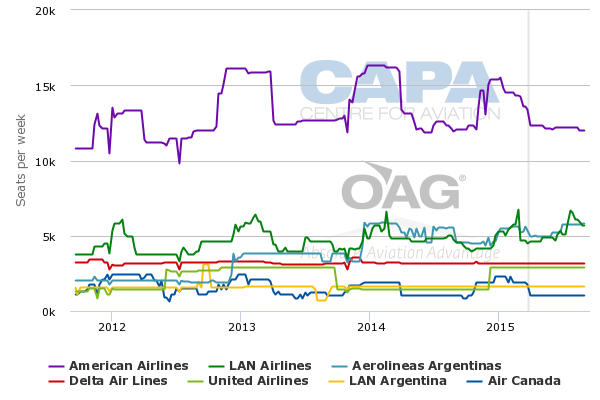 LATAM’s oneworld partner American (which has the largest seat share) has posted about a 13% reduction while LAN’s seats are down nearly 15%. Delta has recorded just 2% growth while United’s seats have fallen by about 3%. eats on offer from lower South America to North America are down about 5% year-on-year, with American (again, with the largest seat share) recording a nearly 16% decline. Delta’s seats are down 3% and LAN’s seats on offer has dropped by about 8%. 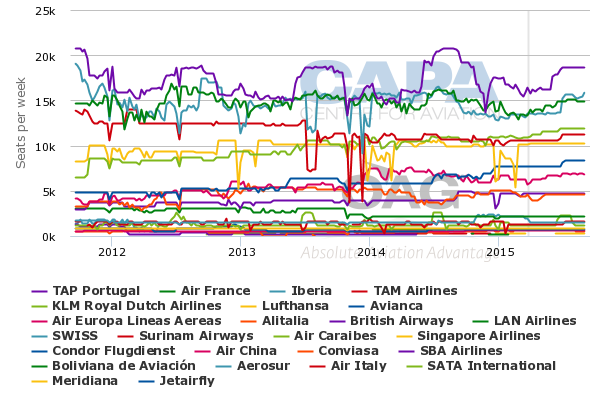 Seats on offer from upper South America to Western Europe are down roughly 2%, with Alitalia recording a 10% decrease, Air France a 10% decline and a 15% drop for Iberia. Seat growth from lower South America to Europe is up approximately 1% year-on-year. 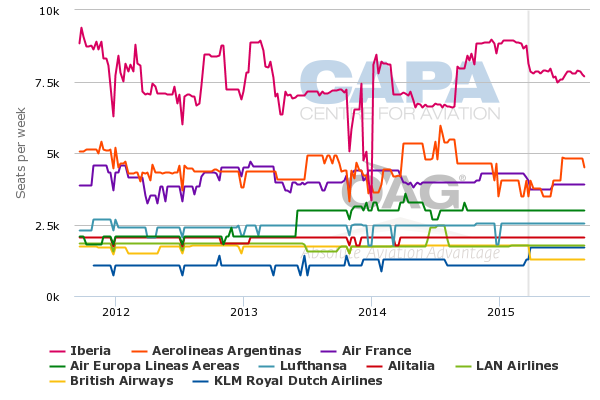 Aerolineas Argentinas has posted a 17% drop, Air Europa is down 9% and Air France’s seats have fallen 4% year-on-year. Among the long-haul routes LATAM is adding in 2015 is service from Lima to Orlando operated by Lan Peru, and new TAM flights from Sao Paulo Guarulhos to Barcelona. TAM in late 2014 also added service from Sao Paulo to Cancun. The company has explained that a portion of its international growth in 2015 is also being driven by expanding service on existing routes. It plans to grow its weekly frequencies from Lima to Cancun from seven to 11, Lima to Havana from three to seven and Lima to Punta Cana from seven to 10 frequencies. LATAM is also planning to expand domestic capacity in its Spanish speaking countries – Chile, Ecuador, Peru, Argentina, and Colombia – by 4% to 5% in 2015 even though it is facing currency devaluation in some of those markets. During 4Q2014 Chile’s currency fell 15% year-on-year against the USD and Argentina’s currency declined 39%. Peru’s currency slid 4%. Some of LATAM’s capacity increase in 2015 is driven by the addition of larger aircraft that will create a favourable unit cost scenario; but the yield pressure will likely continue, resulting in unit revenue challenges at least in the first part of 2015. 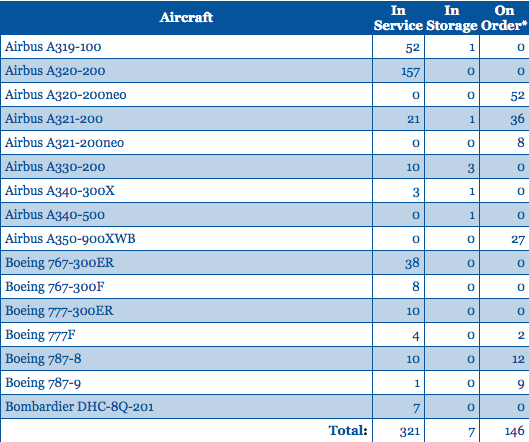 LATAM plans to end 2015 with 17 787s, including seven 787-9s, which are larger than the -8 variant, and according to LATAM, 13% more efficient than the -8. The company also continues to add larger Airbus A321s during 2015, and will also take delivery of its first A350 this year. Even as LATAM continues to face unit revenue pressure at least for the short-term, its costs are trending lower, reflected in a drop of 5.3% in top-line operating costs in 2014. The company is projecting a 6% to 8% operating margin for 2015, which is an improvement over the 4.1% it posted in 2014. LATAM seems to be making rational decisions in its approach to addressing the short to medium term challenges it faces as the overall economy in Latin America remains somewhat tepid. However, it will take some time for yields to recover and the timing of a rebound in Brazil’s corporate market is tough to predict. Although LATAM is on reasonably solid footing, 2015 is shaping up to be another challenging year for the company.